Turkey Pot Pie Surprise | Just The Right Spice! This turkey pot pie recipe is delicious, the surprise inside is that it contains apples and raisins which compliment the flavor wonderfully! This is a great recipe for using up left over roast turkey. Directions: Preheat oven to 425 degrees F. Preheat a large saucepan over medium heat, add butter or oil and onion and sauté until translucent. Add water and whisk in the gravy mix, heat stirring frequently until it comes to a boil. Mix in turkey, apples, raisins, lemon juice and spices. Combine all ingredients together well and heat until just heated through. Pour into a large ungreased baking dish. Roll out pie crust on a floured surface. Place rolled pie crust over top of turkey mixture, tuck sides of pie crust down sides of dish or leave hanging over the edge. Cut slits in top of crust to allow steam to escape. Place in oven for 30 to 35 minutes or until top is brown. You may use left over turkey gravy for this however if you are like me you probably won’t have any! 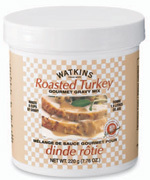 Watkins roasted turkey gourmet gravy to the rescue, it tastes so good you’ll swear your grandmother made it! Brush your unbaked pie crust with a beaten egg yolk for a beautiful, shinny golden brown crust. You’ll find just the right spices and ingredients to make this in the Watkins US catalog or the Watkins Canadian catalog. Wow… this sounds extremely good. Wow, sounds so yummy! I love that you added the apple, raisins, and nutmeg! I am going to try out GF version and I’ll let you know how it turns out!